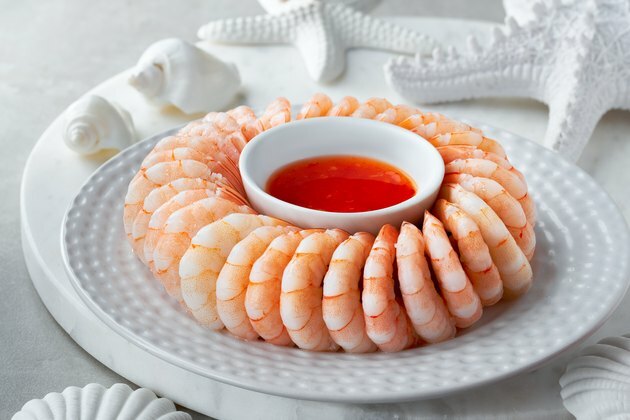 Shrimp are the most commonly consumed type of shellfish in North America. They're typically thought of as a nutritious, protein-rich food, though their high cholesterol content has historically been called into question. These days, there's no limit on the amount of dietary cholesterol you can consume, making shrimp a tasty, healthy food that you can eat in different ways. Many different types of shellfish are popularly consumed in the United States. Shrimp account for about half of the seafood products that Americans consume. Shrimp is also the most popular type traded worldwide. They can be farmed domestically or caught in the wild, with the vast majority of this product being produced in countries throughout Southeast Asia and Latin America. Even though shrimp are so popular, they're often confused with other types of shellfish, like prawns or even baby crayfish. Shrimp and prawns can be cooked in the same way and are generally considered to have similar flavors. In the United States, the word shrimp is often used to refer to prawn (and you'll find the reverse throughout the United Kingdom and Australia), but these are actually two completely different species. Shrimp, like prawns, are 10-footed crustaceans with bodies made up of heads, thoraxes and abdomens. Shrimp are often thought of as tiny prawns, but their bodies have some distinct differences. Shrimp can be distinguished from prawns by their different body shape and gills. Prawns are generally much larger than shrimp, but he most distinct difference is in their legs: Shrimp have claws on just two of their legs, while prawns have claws on three. Shrimp are a flavorful shellfish that can be easily integrated into a wide range of dishes. They have been traditionally eaten throughout America in Creole and Cajun dishes, like gumbo and jambalaya. They are also a major part of many Asian dishes, like tempura; Spanish dishes, like paella and gambas al ajillo; and European dishes, like scampi. There are 106 calories in shrimp per 100-gram serving (5 percent of your RDA), as well as 41 percent of your RDA for protein. Shrimp also contain most other essential vitamins and minerals in low amounts (between 1 and 4 percent). Like other marine creatures, shrimp are considered to be rich in omega fatty acids and cholesterol. There are many different types of shrimp eaten around the world. The most commonly consumed type is called whiteleg shrimp. As with all food animals, the foods shrimp eat and whether they're wild or farmed can influence their nutrition. Until recently, people were advised to limit the amount of cholesterol in their diets to around 300 milligrams per day (or even less if you had certain health issues, like cardiovascular problems). Cholesterol can be found in a variety of animal products, from dairy to shellfish. However, the most recent Dietary Guidelines for Americans no longer limits the amount of cholesterol in your diet. This means that although the cholesterol in shrimp is fairly high (152 milligrams for every 100 grams), it's not bad for your health. The Harvard T.H. Chan School of Public Health recommends that people consume up to 12 ounces (about 340 grams) of fish and shellfish each week. Shrimp is a particularly good choice of seafood as it's low in mercury. Although you may still be worried about your cholesterol, one way to mediate this is to use heart-healthy fats (like extra virgin olive oil) rather than cholesterol-rich fats like butter when you cook your shrimp. You can also opt to use shrimp in healthier foods. This means making your shrimp into ceviche or sushi or cooking it in stews, curries or soups, rather than breading and frying it. One of the main reasons you should regularly consume fish and shellfish is because of omega fatty acids, which come in various types. You'll probably be familiar with omega fats called omega-3, omega-6 and omega-9. Shrimp's benefits include having both omega-3 and omega-6 fatty acids, but they are particularly good sources of healthy omega-3 fats. Omega-3 fatty acids can be found in fruits, vegetables, fish and other foods, but not all omega-3 fats are the same. The omega-3 fats that are typically found in plants are called alpha-linolenic acid (ALA). The ones you'll find in marine animals and plants are EPA (eicosapentaenoic acid) and DHA (docosahexaenoic acid). EPA and DHA are the types of omega-3 fats that have been shown to be particularly good for your health. According to a 2018 study in the Journal of Circulation, the omega-3 fatty acids in shellfish and seafood can improve the health of your heart. Eating seafood regularly can reduce your risk of heart disease, stroke and heart failure. Omega-3 fatty acids also have a range of other health benefits and can help resolve neuropsychological issues, immune system issues (particularly reducing inflammation), diabetes and digestive system issues. The positives associated with omega-3 fatty acids make shrimp a particularly beneficial food for your health. Harvard T.H. Chan School of Public Health: The Nutrition Source: Fish: Friend or Foe? Are Crab Legs a Healthy Food?